Emergency Tree Work after Storm Freya hits. What it takes to provide a top-notch tree surgery service. Let’s face it, tree surgery takes knowledge and skill. It should be left to the professionals that have the experience to take on such a complex service. From knowledge about local laws to knowing how to reduce the crown on a tree, this service is varied and quite unique. Knowledge: Make sure you’re in tune with the most up to date local legislation including tree preservation orders, conservation areas etc. Skills: Having practical skills is essential in providing an exceptional tree surgery service. Tree felling, crown management and stunt maintenance all require practical skills combined with knowledge to ensure that they’re done correctly. Qualifications: Having a formal qualification in Arboriculture will give you the edge when it comes to tree surgery. Understanding the plants, and especially the trees, that you’re working with will make your job that much easier and ensure that your customers get good results from your tree surgery services. Insurance is a must: Ensure that you have Public Liability Insurance covering all work that’s undertaken, this reduces your risk and ensures your customers have peace of mind. Tools: Having the right tools will ensure that all of your knowledge and skills are maximised when you provide a tree surgery service. It also ensures that your service is efficient and safe and the results are of the highest quality. OH & S: Ensure that your occupational health and safety practices are on point at all times. There’s nothing like an incident to smear your reputation within the industry. Understand what your customer wants: Like any service, ensure that you gather all the required information from your customer and understand what their desired outcome from the tree surgery service is. Cutting down a customer’s favourite tree will lead to a very unhappy customer. Cloud Landscapes Ltd are expert tree surgeons as well as hedge cutting specialists in Chichester, West Sussex. To find out more visit our dedicated Arborist Services page. This garden design project was an absolute pleasure to complete. Set in the heart of chichester, with it's incredible views of chichester CATHEDRAL, we were spoilt for choice regarding the POSSIBILITIES of such a sought after location. Working closely with the owners, we decided to strip the old garden back to a blank canvas and start again. The areas had been left far too long unattended and the garden had become overgrown and unmanageable. For practicalities, we went with a sweeping pathway which wrapped the bedding areas. A large patio area at both ends of the garden complimented the views and sun traps. Old style brick edging, bespoke solid oak pergolas and long trellis boundary beams all featured heavily in the design. Once the planting was finally installed the garden came back to life. 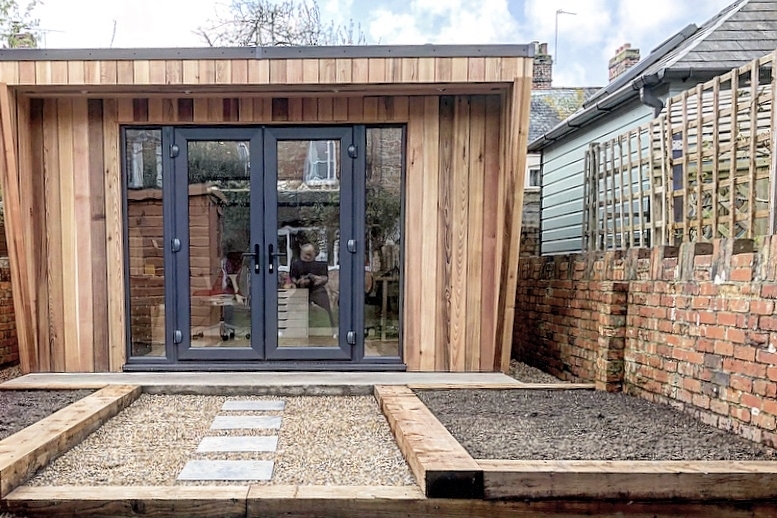 This is most certainly one of our showcase garden builds! For more information on our Design and Build Landscaping Services contact Cloud Landscapes Ltd today. Landscape Design Project | Cambrai Avenue, Chichester. This week our Landscaping team carried out a garden transformation in Chichester, West Sussex. 1. Remove shingle and ground matting from front entrance. Remove stumps and level off area. 2. Create two wooden raised beds either side of the rear back garden. 3. Create divide between existing garden and new hight shingle path leading to garden studio. 4. Instal Indian sandstone stepping path leading to garden studio. 5. Infil around new Indian sandstone stepping path and raised beds with marine shingle. 6. Remove stumps in the back garden. Despite the dreadful weather at the beginning of the week we managed to complete the job before Virgin Media took up half the street installing fiberoptic broadband! The final garden design looks great! Once the borders have been planted out and the grass seed begins to tie in the two garden areas we are certain the small garden will have big appeal! Qualified tree surgeons within a central Chichester location are one of the popular garden services we provide. 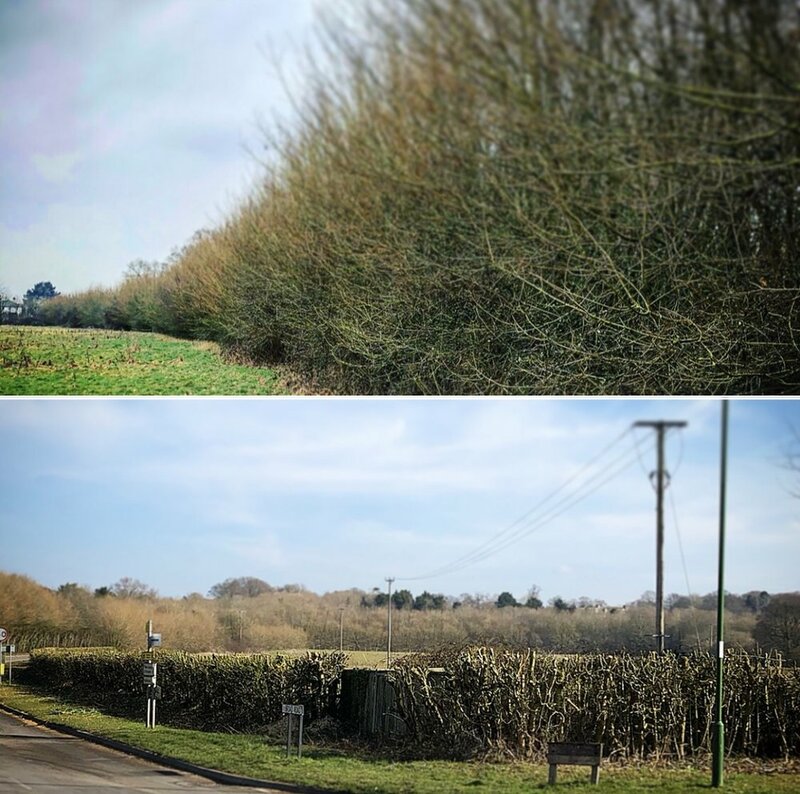 With the summer season fast approaching, Cloud Landscapes Ltd Arborists have been mainly hedge cutting in preparation for this years spring growth. Other popular services at this time of year are efficient, effective tree pruning and cutting. If you require Tree Surveys and Planning, need a private/ residential Tree Surgeon or you are a property manager in the Chichester area, we are proud to offer highly professional tree services to our customers. As a well established Chichester based Garden Services Company we are often asked about our Tree Surgery Services. Cloud Landscapes Ltd are regularly contracted to help maintain and manage a wide variety of areas from stately homes to vast land areas. This week we were asked to tackle a very large hedge in Hambrook, West Sussex. The hedge was used as part of a boundary for a very large field. Unfortunately it had been left for some time and grown to a size which could be no longer managed by a tractor flail attachment. Our associate Guy was put in charge to tackle the 250 metre stretch of hedging which needed to be reduced to approximately 5ft just above the fence line. The sides also needed to be reduced back in the same manner. Despite the snow and freezing cold temperatures the team were able to complete the job in record time. This also helped the client avoid any setbacks due to the nesting bird season. If you are looking for regular hedge cutting services, hedge maintenance or regular garden services, contact Cloud Landscapes Ltd today. We are your trusted Tree Surgeons throughout Chichester, West Sussex! Whenever you are looking for a tree surgery service provider in Chichester, West Sussex, it is best to seek the professional help of an arborist such as the team at Cloud Landscapes Ltd. This professional is the one who takes care of the specialized techniques for this kind of plant. The following are just some of the most common tree services that you can ask an arborist to do. If the size of the crown is too large for it, then the best solution is to reduce it. But then again, it is very important to maintain the natural shape. Arborists make sure that the spread and height of the crown is reduced by means of pruning every single branch. Balance and suitable outline are considered in locating appropriate union for the branches during pruning. This option of pruning is most fitting for fruit-bearing ones and those that are less than 20 feet tall. Tree Crown reduction in Chichester is also the process of making a tall tree shorter by trimming the tallest branches at its top. If you are dealing with a very large landscape tree, such as an oak or maple, it's wise to hire a professional firm to do the work for you, because they have the right equipment to prevent accidental injury. Getting your trees trimmed is one way of maintaining their good health while improving overall appearance and extending life expectancy. While tree crown reduction primarily involves removing new growth around the outer portion of the tree's perimeter for a better aesthetic appeal, you can also do some basic pruning or removing of dead, unsightly, and insect-infested branches. There's a saying that goes "Trim trees anytime your saw is sharp," and you can actually choose to do this for just getting a snip here and a snip there. But to make the most of your tree crown reduction activity, timing is an important factor to consider. For instance, many flowering trees already have their flower buds set way before they bloom. Cutting off these blooms prematurely would therefore result in their inability to bloom the following season. Once you've already established the right season for tree Crown reduction, then it's time to get hold of that tool and just trim away. Remember, anytime you are trimming a tree, always select your branches very carefully and consider them twice before you actually cut. Once a branch has been cut, there's no way to put it back, and many a fine landscape tree has been disfigured by a poor trimming job. If you do hire an arborist for a professional tree crown reduction, be sure to hire Tree Surgeon in Chichester, they are known for thier great service deal about hedge cutting and garden maintenance. They spends a great deal of time writing about tree surgeons and their various tree care techniques. For more information about Tree Surgeon in Chichester visit our website. It is only possible to keep your Chichester hedges looking beautifully manicured with regular garden maintenance? Our experienced arborists will be able to identify the plant species for you to ensure the correct timing and extent of the hedge work required. By reducing the number of annual cuts you can keep a hedge in check but still enjoy the flower, fruit and autumn colour that the species provide. Beech (Fagus sylvatica): Tolerates relatively hard pruning. Blackthorn (Prunus spinosa) Tolerates very hard pruning). Box (Buxus sempervirens): Tolerates relatively hard pruning. Elaeagnus: Tolerates very hard pruning. Euonymus: Tolerates very hard pruning. Hawthorn (Crataegus monogyna): Tolerates very hard pruning. Holly (Ilex aquifolium): Tolerates hard pruning. Holm Oak (Quercus ilex): Tolerates hard pruning. Hornbeam (Carpinus betulus): Tolerates hard pruning. Laurel (Prunus laurocerasus): Tolerates very hard pruning. Portuguese Laurel (Prunus lusitanica): Tolerates hard pruning. Privet (Ligustrum ovalifolium): Tolerates hard pruning. Pyracantha: Tolerates very hard pruning. coniferous tree species that does). Yew (Taxus baccata): Tolerates relatively hard pruning. Prune those plants that flower on the current season’s growth, like as Fuchsia, once in spring, as they will still be able to produce flowers that year. For plants that flower on one-year-old growth like Pittosporum, reduce the current season’s growth by half in summer. In the case of shrubs that produce berries, such as Cotoneaster and Pyracantha, delay trimming until the berries disappear. Chichester Paving Specialists - What You Need to Know Before Starting a Paving Project! Paving is described by Wikipedia as 'a stone or tile structure, the paving, which can serve as a floor or external feature... can be made of flagstones which are used for things like paving gardens. Paving has been used for thousands of years. In fact, some roads and paths built by the Romans with tightly fitting pavers over a base aggregate, two thousand years ago still form the base for modern roads in parts of Europe. If nothing else, this tells us that they're durable! Whilst we spend a lot of time and money on being creative on the inside of our houses, it won't have the same impact if we neglect the exterior. The outside of the house is what people see first. The idea that 'first impressions count' is a valid one. If your property has not been maintained and/or improved on the outside via considered landscaping, then it will detract from all your efforts on the inside. People will have that negative first impression which will be hard to overcome. Likewise, people spend a lot of time in their yards, children are encouraged to get outside and do something physical rather than sitting in front of the PC. You're more likely to enjoy spending time outside or entertaining, if the backyard looks good. A big part of any landscaping or improvement is paving, be it a paved driveway, a paved edging to an existing driveway, a paved path, edging along garden beds, or a paved patio. We have found that a lot of people are finding that maintaining a large lawn area is, not only time consuming, but more difficult with water restrictions. One way of cutting down on their lawn area is to have a paving feature which adds a bit of character to the yard as well as reducing the time and work involved in upkeep. Our Landscaping, Tree Surgery, Garden Design and MAINTENANCE service extend from our Chichester base to Lavant - Selsey - Aldwick - Itchenor - Barnham - Emsworth - Wittering - Bracklesham - Birdham - Bosham - Westbourne - Ashling and within a 10 mile radius of chichester.